To finish off their three-game road-trip the Canucks play the Chicago Blackhawks at the United Center tonight @ 5:00 pm/pst. Coming off a 4-1 loss to the Dallas Stars last night, it doesn’t get any easier for the Canucks tonight as they take on the NHL-leading Chicago Blackhawks in Chicago, where they haven’t won since November 2011. The Blackhawks are hot, having won 5 of their last 6 games. During this span, they’ve outscored their opponents 28-15, and their powerplay clicked at a deadly 39% (10 PPG on 26 PP opportunities). On the other hand, after winning 7 games in a row, the Canucks have cooled off and have now lost the first 2 games on this 3-game road trip. Tonight will be their their 3rd game in 4 nights, and their 4th set of back-to-backs in the last 4 weeks. Maybe a visit to the Madhouse in Madison can help wake up the Canucks. Normally, Lu would get the start against a team like the Blackhawks, but he was pulled in favour of Eddie Lack last night against the Stars after letting in 4 goals on just 19 shots. Plus, John Tortorella has tapped Eddie Lack to start the 2nd half of back-to-backs all season. If Lack does start, he should still have some good confidence; he posted a shutout in his last start, a 2-0 Canucks win against the Carolina Hurricanes. The Blackhawks are missing their top two goaltenders, Corey Crawford and Nikolai Khabibulin, but that hasn’t slowed them down. Antti Raanta will likely start. He’s started 7 games since Crawford was injured, and has a 5-1-1 record and 0.921 save percentage in those games. 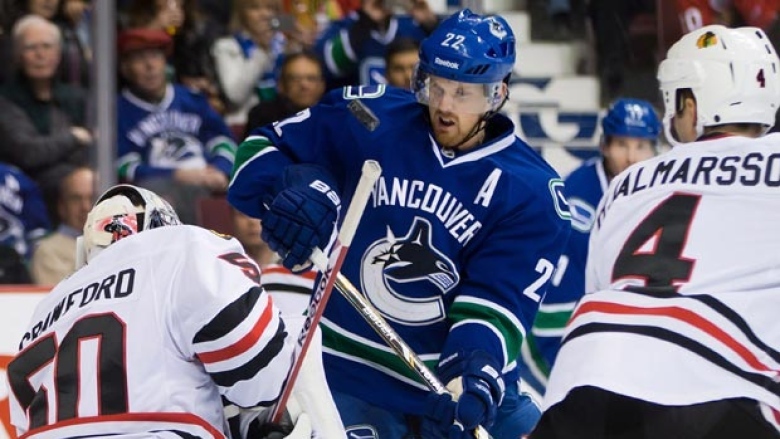 The Canucks are without Alex Edler (lower body), Alex Burrows (jaw), Jordan Schroeder (ankle) and Ryan Stanton (ankle). Stanton injured his ankle on Tuesday and is out indefinitely. Other than the goaltenders, the Blackhawks are healthy.